I've written here before about my time growing up in the country and how memories from those younger years still influence my design tastes. Although I currently reside in the city, I know for sure that one day I'd like to head back out to the countryside; embracing a more typical country interior when I do. The terracotta tiles seen here are smaller versions of ones my parents had in the kitchen of our country home, so I'd like to adopt those into my as yet imaginary country escape. The well-stocked dresser? Yep, we had one of those, too, so it would be wrong not to replicate in my country space of the future. Of course, I'll be snapping up the blue table (a Mr. Bazaar fave!) and that green workshop shade will more than likely be setting up camp in the space as well. In fact, folks, I think the space might just look a little like this - I can't wait! What elements do you like in this kitchen space? I like the eclectic mix of country with the industrial lighting. I has a casual feel that is very inviting. Thanks for visiting my blog, and for the nice comment. I love the country. This kitchen is perfection, super cozy...and I'm all about cozy. The lighting, floor, pop of color on the table...love it all. Love the blue table! We're the opposite- I live in the country but want to live in a city one day! I love the blue table! @Jamie, Nancy - I can picture myself there at dawn with lots of coffee and pastries! @Rosemary - The industrial lighting is one of my fave features of the space. @Miss Rubio - Yay! Another country lover! @homeboundtheheartoflife - Good idea re: painting the dresser white. @Hannah - Perhaps we should swap for a short while like they did in that film The Holiday! @nuria1966, Urska - I love the table, too! I'd love to have a beautiful country house. Who knows, maybe an oportunity is coming. The blue table is gorgeous. Congratulations on your blog, it's great. @Carla - The country is the best! @littletree - I agree! Painting a table is a great way to update a tired kitchen or dining space. @Tereza - Thanks so much for your kind words! THANK YOU for yesterdays post, for showing me West Elm heaven!! New to your blog this week and I'm obsessed! Every post is amazing with so much eye candy. The blue table? what an awesome piece! Will! How do you find these beautiful places? I LOVE this, I wanna sit right down at that glossy blue table (droool) and eat me some of those grapes. It's just lovely. I want to live here toooo. When I build my dream house (one day) will you please come and be my personal decor advisor/designer, your style is so spot on! @Maria - Anytime! West Elm rock; great choice with the snow globes! Let me know what they are like when they arrive! @Julia - So pleased you are enjoying it; thank you for reading! I do like this funny green lamp! I love the entire mix! And I love rooms/homes that show sign of life.. Contrived rooms make me yawn..
Will, you will soon be able to buy your own country home - with all the design fun projects coming your way! I believe it will happen sooner than you think! Yes, really! 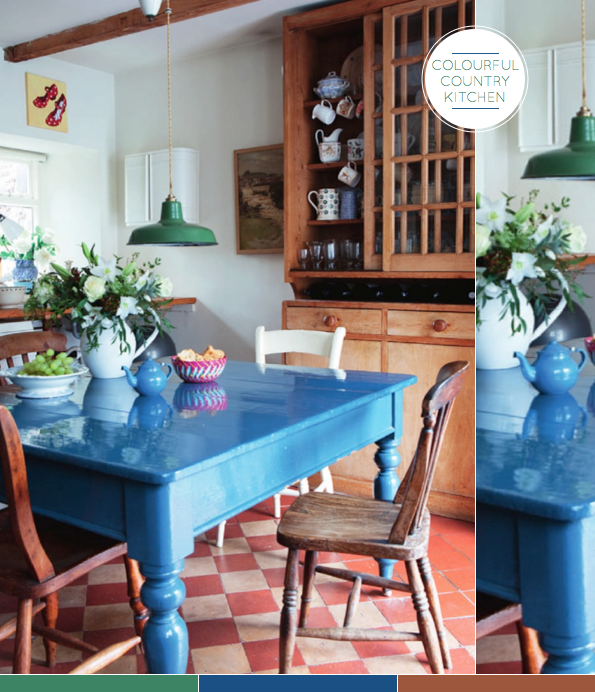 Love the blue table and the green pendant light! What a fun mix! I love the color palette. So relaxing but so funny! When we own a home one day (i.e. more space), I have big plans to paint & lacquer a wooden table like this.